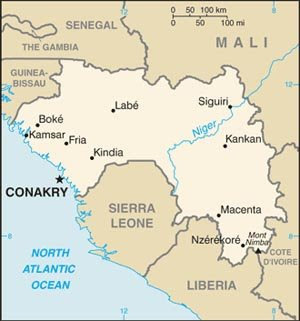 The U.S. Department State has ordered the departure of non-emergency personnel and eligible family members of the U.S. Embassy in Conakry, Guinea on October 1. This occurred days after the country's military units opened fire on civilians and clashed with protesters at an opposition rally that killed over 150 people. The violence came about reportedly when political parties and trade unions defied the ruling National Council for Democracy and Development (CNDD) military junta's protest ban. The protest was organized against reports that CNDD Leader Moussa Dadis Camara might run for president in the January 2010 election. "The Department of State warns U.S. citizens against travel to Guinea due to continuing civil unrest and the unpredictable nature of the current security situation. U.S. citizens are advised that the Department of State has ordered the departure of non-emergency personnel and eligible family members of the U.S. Embassy in Conakry, Guinea.